Because the Tunisian Tourism Minister Rene Trabelsi is Jewish, many Tunisians are out to get him. One recent example I reported on was when a radio show tried to get him on the air to dispel a rumor about him trying to normalize relations with Israel - and he refused because it was Saturday, causing an uproar about his putting Judaism above his duties. The newest controversy is that he was seen in an interview with i24News, where he said that he is committed to support the Palestinian cause and establish peace in the Middle East. One reason is because he was on an Israeli TV network. It doesn't look like he spoke to i24News directly, but through a partner channel, but the Tunisians are saying that clearly that was a ruse and he wanted to talk to an Israeli channel. The other reason is that he said that he wanted peace. 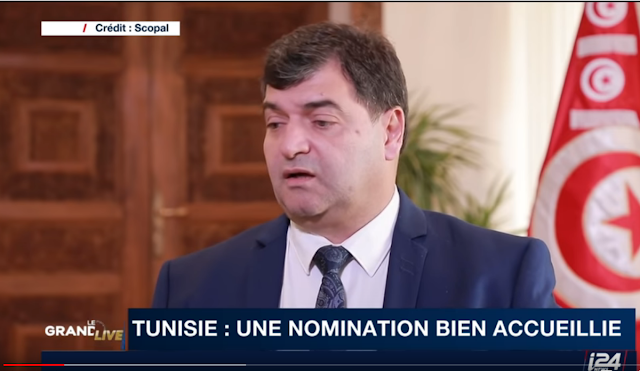 What business does he have to speak for Tunisia's foreign affairs ministry? By saying he wants peace, he is implicitly agreeing that Israel should exist! The Popular Party called for his dismissal from the government, saying that he is clearly a Zionist and is acting like a foreign minister, and knowingly speaking with Israeli media.